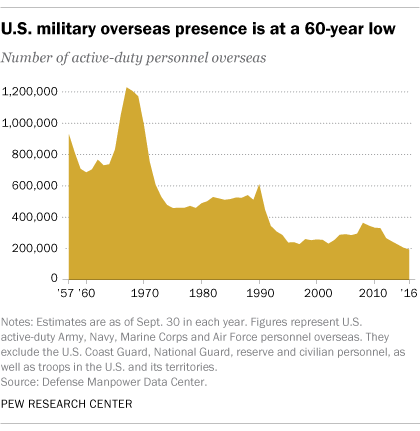 The number of active-duty U.S. military troops stationed overseas has dipped below 200,000 for the first time in at least 60 years. The decline, reflecting a broader one in active-duty U.S. forces, has occurred in multiple countries – including South Korea, which has become a focus of attention amid escalating tensions between the United States and North Korea. There were around 1.3 million total active-duty U.S. military personnel in 2016. Of these, 193,442 – or 15% – were deployed overseas. That’s the smallest number and share of active-duty members overseas since at least 1957, the earliest year with comparable data, according to a Pew Research Center analysis of information from the Defense Manpower Data Center, a statistical arm of the Department of Defense. The five countries with the largest active-duty U.S. military presence in 2016 were Japan (38,818), Germany (34,602), South Korea (24,189), Italy (12,088) and Afghanistan (9,023). Of the top five countries, Afghanistan is the only one in open conflict, an issue that President Donald Trump addressed in a speech Monday. Regionally, Asia and Europe accounted for 70% of the U.S. active-duty military presence worldwide in 2016. Asian countries had the highest share of overseas troops (38%), while around a third were deployed to Europe (32%). Nearly one-in-seven active-duty members were in the Middle East and North Africa (13%) and 3% were in sub-Saharan Africa or the Americas (excluding the U.S. and its territories). The remainder (14%) were in other locations, such as at sea or between territories. Within the past 60 years, the U.S. had the most troops overseas during the Vietnam War era. The number of active-duty U.S. troops overseas peaked at 1,228,538 in 1967 (36% of the total active-duty force), with more than 450,000 in Vietnam alone. The following year, Vietnam had the largest U.S. military presence of any single country in the past six decades, with 537,377 troops – nearly 45% of all active-duty troops overseas at the time. In this analysis, unless otherwise noted, active-duty military figures include the Defense Department’s four military branches: the Army, Navy, Marine Corps and Air Force. They exclude the Coast Guard, which is part of the Department of Homeland Security, as well as National Guard, reserve and civilian personnel, as data for these forces are not available for all years. All years represent military personnel as of Sept. 30. Preliminary data for 2017 are available here. Correction (July 2018): Due to an error in data provided by the source, a previous version of the chart “Most U.S. troops are in Europe or Asia” incorrectly placed Austria in the top 20 countries for U.S. troop presence and gave incorrect figures for Europe and Asia overall.